The Sunday Salon [9.25.11] – my books. my life. 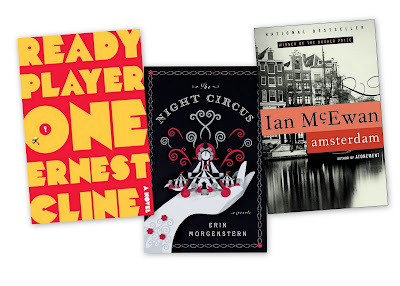 This week I finished The Night Circus (psst…there is still one more day left in my giveaway), Amsterdam and Ready Player One. I’m kind of between books at the moment – choosing between a review copy and a library book. Find out which one wins next week (I gotta keep you coming back somehow). Finally, I received my Pottermore email on Friday. My name is CauldronWing157 if you want to connect there. But please tell me who you are first so that I will accept your request. Enjoy your weekend. And your fall weather. Don’t rub it in too much or I might have to share beach pictures. I live in Houston, so we’re in the same boat when it comes to temperatures. I want fall. The BF’s daughter (she’s 4) thought that everything would magically cool off on Friday because it was the first day of fall. She was not happy when that didn’t happen. P.S. I’m dying to know what you thought of Ready Player One. I read first, but I have the audio and I’m going to revisit it soon. I have two review audios to finish first. I made my Hubs move to the East Coast just so I could enjoy Fall again. And I’m actually loving the Salted Caramel Mocha as opposed to my usual Pumpkin Spice. Sent you a Pottermore request- I’m SeekerSilver77 on there, and in Ravenclaw too! Mostly I’ve just been brewing potions for the last week or so, but I guess that’s part of being a beta tester. Wish I’d gotten on when there was still dueling. Blah. I’m sitting here watching my daughter take horseback riding lessons and sweat is dripping down my back. I would love to be able to war a jacket and have a lattein comfort. The day will come! I can’t wait. But yes, swimming in the ocean on Martin Luther King Jr. day is the perk of living here! I didn’t really like Amsterdam, and am really curious as to what you thought of it. It was just a weird little book. As far as the other two go, I have been anxious to read Ready Player One, and loved The Night Circus, so I am admiring your choice of reads. I am also longing for the cooler weather, and think it will be so nice to pull out the winter boots and long sleeve shirts, whenever it gets cooler here! I received an ARC of the Night Circus earlier this year- possibly the most beautiful book I’ve read this year! Enjoy your great weather! This weekend was lovely, but when I think about the grey days and cold rain I envy you :)Though I am looking forward to pumpkin spice latte! Ah, yes. We got fresh apple cider donuts yesterday. I made chili, pumpkin muffins and apple cake. It was sunny and in the mid-70s all weekend. I simply adore this weather and wouldn’t trade it for all the winter in the world. Of course, I *might* need a reminder of this fact in January. I really need to start reading THE NIGHT CIRCUS, although part of me wants to wait since it is getting SO much attention these days. I do have READY PLAYER ONE waiting for me on audio. I’ll be curious to read what you think of it. I am also curious to see what you read next! I’ve heard such good things about Ready Player One, will you post a review? I haven’t indulged in any of the new flavored coffees or anything yet because you’re right, it’s just NOT the same when it’s still summer here. I don’t typically start feeling like it’s fall till right around Halloween and then only because the decor is everywhere, LOL. I have Ready Player One and The Night Circus, but only started Night. It’s not pulling me in yet. It’s supposed to be over 100 degrees this week in So Cal so it doesn’t feel like fall to me either. I’ve been burning Pumpkin Spice candles but drinking ICED pumpkin spiced coffee. We’ve got mid-50s weather on the way for this weekend. After the hedonistic temperatures of the summer I can’t decide if I’m looking forward to it or if it’s going to feel like the tundra.